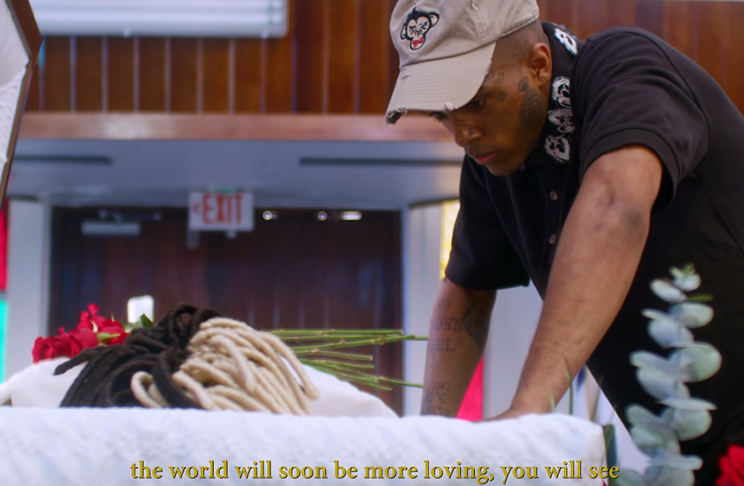 In a posthumous video released ten days after his death, XXXtentaction attends his own funeral and communicates with a mysterious being. Here’s the meaning of this symbolic videos. The death of XXXtentacion on June 18 – at the young age of 20 – has startled and saddened his millions of fans. Ten days later (and one day after X’s funeral), the video for SAD! was released and his fans were startled again: The video portrays X attending his own funeral and fighting his own dead body. What is happening here? The video quickly became #1 YouTube and many of X’s fans (who are often very young) are utterly confused. The comments say: “What does this mean?”, “How did he know?”, “Is he still alive?”, etc. The fact that the video was written and “creative directed” by X himself makes the video even more unsettling. It is as if he had a premonition that his own death was coming. This entire situation is heavily reminiscent of 2Pac’s death. On September 13, 1996, 2Pac died after being shot while sitting inside a BMW (X was also shot while sitting inside a BMW). A few days after his death, the video for I Ain’t Mad at Cha was released and it stunned the world: The video depicted 2Pac being killed by gunshots and finding him rapping in heaven. The video was recorded weeks before his actual death.